No test is too big at CAPE, and we have the pictures to prove it. 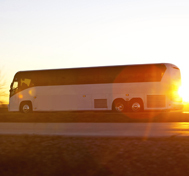 When it comes to the motorcoach industry, the relationship between CAPE and our parent company, IMMI, is a game changer. IMMI has worked hard to make motorcoach passengers safer by developing Premier, an innovative seat with lap-shoulder belts that protects both belted and un-belted riders. 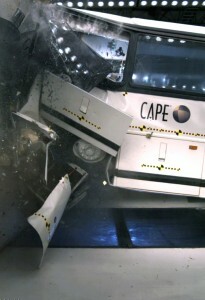 IMMI validated Premier at CAPE through a number of tests, including a barrier crash, sled tests, and finite element analysis. In 2010, CAPE became the first test house to test the effectiveness of seat belts on motorcoaches, effectively helping Greyhound to implement seat belts on their line of motorcoaches for the first time in history. With the biggest barrier block in the world, crashing a full-sized motorcoach was easy for a facility with CAPE’s commercial vehicle testing expertise. As dramatic as that video is, barrier/frontal crash testing is just the beginning of what we can do for the motorcoach industry. With new NHTSA requirements soon to take effect, CAPE works with your schedule to deliver precise results in whatever area of testing you require.